Meet our newest contributor Gioel Gioacchino. We are excited to be supporting and learning from her research in Columbia on the effects that different funding models have on the health, integrity, and vibrancy of social purpose organizations. This article was originally published by Open Democracy. However, I left the Colombian capital disappointed. What was missing were energy and spirit, some sort of transcending vision that would move people to truly radical action. There were plenty of discussions about the lack of funding for civil society, for example, but nothing about inventing a different financial system altogether as an alternative to greed. It almost felt like a group in denial about its own decline and increasing co-optation. But maybe that’s just me? To test out my reactions I met up with my friend Ana Pranjic after the conference for a quick debrief, the Vice-President of the Board of Directors for the 2016 World Social Forum Collective. We sat together on a white leather sofa at the Continental Hotel and I asked her about her experiences, because to me she embodies what civil society is all about. She’s funky, disrespectful of convention and her presence provides a jolt of electricity. When she enters a room the consistency of the space starts to change. She’s a laugh in the face of buzzword-talk, and her eyes are sharp with curiosity. So I wasn’t alone in my frustration. In fact for the last five years I’ve been listening to many young people’s stories as part of my work with Recrear, an organization that provides a space to explore their relationships to society through participatory action research. I feel these stories in my chest, like squawking voices or the opening and closing of strange funnels of energy. Young activists’ experiences of transformation are often raw and loud, more a state of being than a project, and something that’s difficult to contain or convey in the halls of a conference. That’s what was missing from CIVICUS. Robinson Bustamante, for example, is a well-known youth activist in the Colombian city of Medellin, and he captures this discomfort very well. I sat down with him for an interview a few weeks ago after a workshop on youth engagement in the city. In front of a black coffee, he shared his experiences of the last ten years. Maybe that sums up the state of civil society today—either join the market or resist on the margins. But is it possible to move that resistance from the margins to the mainstream, and what would that mean for civil society going forward? It’s not that there aren’t powerful alternative visions developing in civil society around the world; the problem—as Ana confirmed—is that they’re not taken seriously or supported to develop. At venues like CIVICUS their experience is marginalized or ignored, their value dismissed because they don’t fit with what have become the new conventions of the sector. But this means that civil society groups are distancing themselves from the drivers of social transformation. By contrast, Organization Unbound’s exploration into the link between peoples’ experiences working for an organization and the organization’s actual impact in society has revealed that the most successful groups don’t see themselves instrumentally, but rather “live internally what they are trying to create out in the world.” That’s a crucial observation if civil society is supposed to function as a space to “rearrange the geometry of human relations” as political scientist John Ehrenberg describes it. In 2012, Recrear worked in the Ecuadorian province of Esmeraldas, researching how young people interact with civil society through creative workshops. We asked more than 100 of them to capture in one word what being part of their community meant. 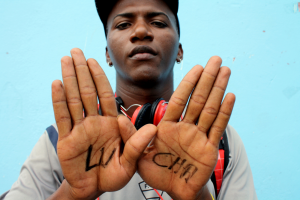 Mario, a young man from Esmeraldas city, chose ‘lucha’, which in Spanish means ‘fight’ or ‘struggle’—the struggle of being a good person every day as he explained it. I thought about Mario’s struggle during the closing ceremony of the conference, when Leonor Zalabata Torres, an indigenous leader from the Arhuacos community in the Sierra Nevada mountains of Colombia, stood up and said: “We are working on a way of being, the peace we look for is inside.” Her words hung uncomfortably in the air in a room that was drowning in civil society buzzwords. That shift from doing and saying to being and being together is revolutionary. But Torres’ speech was the exception. How do we create more spaces to socialize such a radically different philosophy of action and understanding? And what would such spaces really look like? For a start, they would have more intimacy, more playfulness, more imagination and accessibility. They would look less like a procession of white males on a panel. They would involve less time sitting, and more time actively exploring our feelings, more experiential learning, and a deeper acknowledgement of our symbiosis with nature. These spaces would need the foresight to acknowledge that deep change won’t be successfully monitored through logical frameworks or quantitative metrics. Instead, as Mario emphasized in our conversation, change will come only by accepting our participation in a daily personal and collective struggle: a graceful, unselfconscious and radical search for a harmonious life together. To me, that’s what ‘civil society’ really means. This article is a re-print from www.opendemocracy.net, with slight modifications made to the paragraph referencing Organization Unbound. It is published under a Creative Commons Attribution-NonCommercial 4.0 International licence. If you have any queries about republishing please contact Open Democracy. Photo credit: Mario, from Esmeraldas City in Ecuador. Credit: Valerie Matron. All rights reserved.